ONTARIO — For the first time in decades, Richland County has a new hospital. 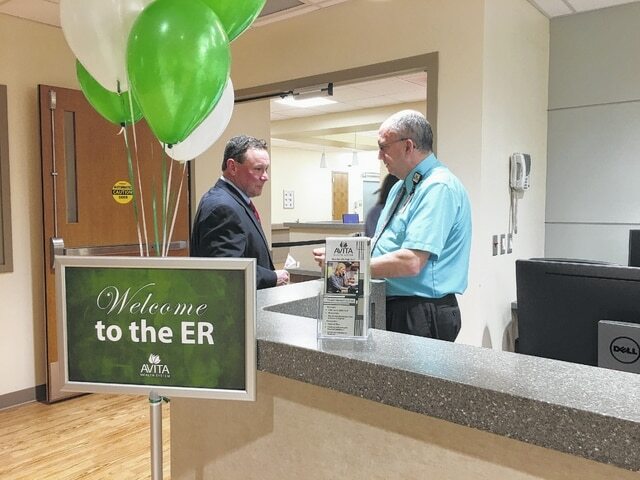 On Thursday, Crawford County-based Avita Health Systems had an open house at the Avita Ontario Hospital, located in the Richland Mall. The hospital features a 23-bed emergency department that will be open 24 hours per day, seven days per week; a seven-bed intensive care unit; a 19-bed inpatient wing; four surgical suites; a 16-bed pre- and post-op area along with laboratory; and radiology, cardiology and pulmonary departments. According to Avita CEO Jerry Morasko, a cath lab and cardiac rehab will be opening at the new facility soon. “We are offering more choices for patients along with helping the merchants in the mall which also helps the city. It is a win-win for everyone,” said Morasko during a ribbon-cutting ceremony held at the hospital on Thursday. Ontario Mayor Randy Hutchinson agrees. “This facility will help in our rebound from the closing of the GM (General Motors) plant and is providing more traffic to the stores in the mall. It is a great investment in our community,” he said. Doug Schilling, president of the board of directors for Avita, said the $42 million project was phase two of a three-part process, the first being the doctors’ suites and lab that were already located in the former Lazarus portion of the Richland Mall. “This started at a strategic planning meeting in 2012,” he said. Morasko said many patients were coming to Crawford County from the western portion of Richland County for health care. “It made sense for us to open a hospital in Ontario to better serve local residents,” he said. David Douglas of the USDA (United States Department of Agriculture) said the agency provided Avita with a low-interest loan to complete the project that began in November of 2015. “This is the largest facility that the USDA has provided funding to in Ohio,” he said. The project has added more than 300 full-time jobs in Ontario, which will improve tax revenues for the city. For more information, visit http://avitahealth.org/home.